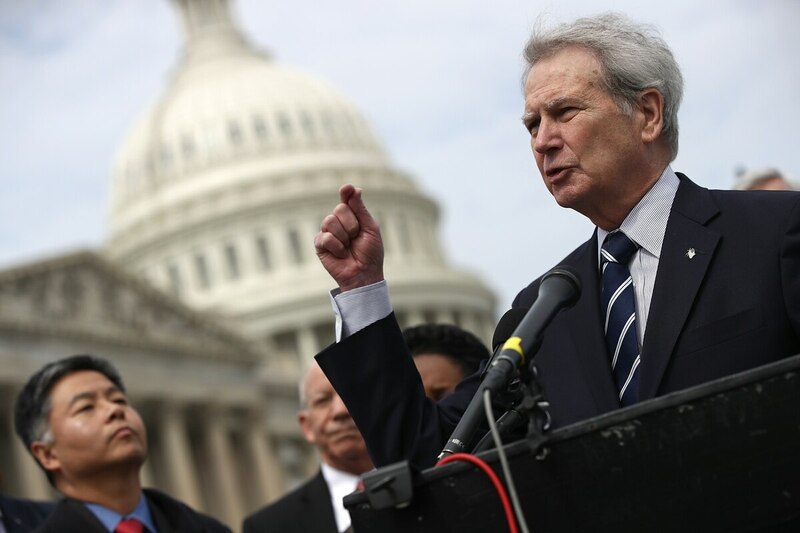 Rep. Walter Jones, R-N.C., a strong advocate for service members on Capitol Hill who also became a tough skeptic of the wars that followed 9/11, has entered hospice care, according to a local news report. Jones' office issued a short press release Saturday confirming that he is in hospice, and said his health declined after breaking his hip Jan. 14. “The family asks for your prayers, and for their privacy to be respected during this difficult time," the release said. North Carolina TV station WITN also reported Saturday that an undisclosed illness had forced Jones to take a leave of absence from voting in Congress in recent months. Jones, 75, who became a congressman in 1995 after serving in the North Carolina General Assembly, voted to authorize the Iraq War, but turned sharply against the war and renounced his vote in 2005. In a 2017 interview with NPR, Jones said he tries to write to the families of each service member killed in action. “I have signed over 12,000 letters to families and extended families who’ve lost loved ones in the Iraq and Afghanistan wars, and that was for me asking God to forgive me for my mistake,” Jones told NPR. Jones also pushed Congress to re-examine the Authorization for the Use of Military Force passed after 9/11, as well as the AUMF passed the next year approving action against Iraq. Presidents of both parties subsequently used the AUMF to support subsequent military actions, which critics such as Jones said went further than the AUMF was intended. In 2018, Jones teamed up with Rep. Barbara Lee, D-Calif., to urge the Senate Foreign Relations Committee to pass a new AUMF that is “specific, tailored, limited and clear,” and repeals the 2001 and 2002 authorizations. The hell these men have endured stands among the Afghanistan war's great tragedies. Jones is a senior member of the House Armed Services Committee and is known for serving as a voice for troops, veterans and their families. His North Carolina congressional district includes the Marine Corps' Camp Lejeune. He led a years-long effort to defend the Marines of Task Force Violent, the first company from Marine Corps Special Operations Command that was sent into combat, after they were falsely accused of killing innocent bystanders and committing war crimes in Afghanistan in 2007. Those Marines were vindicated in a review, but were blackballed for years. Jones has continued working, and earlier this month introduced a bill to cut red tape for military families and get them benefits quicker when their loved one dies in the line of duty or from a service-related injury or disease. In 2018, Jones pushed to expand access to commissaries and exchanges to more veterans such as Purple Heart recipients, former prisoners of war and veterans with service-connected disabilities. And last February, Jones called for the House Ways and Means and Oversight and Government Reform committees to investigate fraudulent organizations scamming veterans. He served in the North Carolina National Guard from 1967 to 1971.